Many of the congressional aides and federal agency staffers working to combat climate change are also investing for retirement in companies that are making the problem worse. That's because the U.S. government only provides a few tax-deferred stock market investment options for its civil servants and uniformed service members through its Thrift Savings Plan, or TSP. All of those funds appear to contain substantial holdings in businesses that produce or burn vast quantities of planet-warming fossil fuels, according to an analysis conducted for E&E News by As You Sow, a nonprofit that advocates for corporate environmental and social responsibility. The TSP currently is legally allowed to offer some fossil fuel-free funds, but hasn't exercised that authority in part because federal worker unions don't consider it a top priority. Some lawmakers and staffers, however, are starting to take a closer look at the nexus between climate and retirement policies. "Most of people's savings are in their retirement plans, and it's completely misaligned with their values," said Andrew Behar, the advocacy group's CEO. Many Hill staffers are aware of the ethical and financial challenges of attempting to shift the U.S. economy away from its dependence on fossil fuels while personally profiting from the environmentally destructive status quo. "It's totally hypocritical until you look at the fact that, what is my other option?" an aide to a progressive senator said in an interview. The aide, like all of the congressional staffers contacted for this piece, only agreed to speak on the condition of anonymity. Unless staffers put their retirement money "in purely government securities or bonds, which would be irresponsible for someone at my age, anyone with TSP investments will inevitably have some investments in these energy companies," said another aide who is more than a decade away from being eligible to retire. It wasn't always that way. In 1920, the federal government began providing retired federal workers pensions of up to about 56 percent of their top salary. But in the 1980s, lawmakers scaled back federal pension guarantees and created the TSP to allow workers to supplement their pension and Social Security payments by investing pre-tax earnings in certain stock market offerings. Hill staffers and other federal employees are now automatically enrolled in the government-run investment plan when they enter the civil service. The TSP currently manages around half a trillion dollars' worth of retirement investments for some 5 million participants. It operates like a 401(k) plan for private-sector workers. The government matches the first 5 percent of federal employees' investment from their salaries. The amount workers get out of the TSP when they retire is determined both by how much they put in and how their investments did. Under current law, the TSP can only offer three stock market index fund investment options for participants. Such funds track broad market segments, which makes them resistant to political manipulation and keeps their administration costs very low. But they also limit investors' ability to avoid putting their money into the fossil fuel industry or other companies whose products or business models could raise concerns. The index funds included in the TSP have net administrative expenses of 0.041 percent and significant amounts of fossil fuel assets. The C Fund is likely made up of large and medium-sized U.S. companies and currently counts oil major Exxon Mobil Corp. as one of its top-10 biggest stock holdings. As You Sow estimates that 10 percent of its investments are in fossil fuel companies. The S Fund has small- and medium-sized companies not included in the C Fund. About 6 percent of its value is likely tied to fossil fuel assets. Worst of all, for climate-conscious federal investors, is the TSP's I Fund. The value of the international-focused index seems to be made up of 12 percent fossil fuel assets, with holdings in Royal Dutch Shell PLC, BP PLC and Total SA among its largest. The fund also appears to invest in palm oil producers as well as banks and consumer brands that support the deforestation-linked product. Because the TSP doesn't disclose a full list of its investments, As You Sow analyzed indexes identified by the investment research company Morningstar as likely virtual matches for the C, S and I funds. Behar wasn't surprised by the composition of the TSP funds, which he said were similar to most of the $8.4 trillion in investments supported by private-sector workers' 401(k) plans. "That's the thing: We are all funding and part of this system that we're all saying we want to change," he said. House Democratic leaders have made curbing climate change a top priority, yet many of them also have substantial campaign and pocket-book connections to the fossil fuel industry (E&E Daily, Feb. 15). As You Sow, which was founded in 1992, has recently sought to green the retirement investment system — so far, with limited success. "We've been working for several years now to try to get companies to just add one [fund] that has environmental, social and governance screens or is fossil free," Behar said. "It has been a brick wall." In 2009, lawmakers passed a bill that could give federal workers and uniformed service members a way out of banking on the continued success of the fossil fuel industry. But more than a decade after President Obama signed off on the Thrift Savings Plan Enhancement Act, the board that oversees the TSP hasn't finished setting up a "mutual fund window" the law allowed. The delay was partially due to the Great Recession, which dragged down stock markets at the beginning of the Obama term, according to a spokeswoman for the Federal Retirement Thrift Investment Board, or FRTIB. The board, which administers the TSP, and the Employee Thrift Advisory Council (ETAC) — a federal union body that offers advice to the board's presidential appointees — "weren't wild about the idea," said Kim Weaver, director of external affairs for the FRTIB. "When it was first discussed before the board and ETAC, they didn't want to pursue it," she said. That has begun to change. In 2014, FRTIB approved a plan from career staffers to study how to integrate more actively managed mutual fund offerings. Staffers are still working on that plan, which will need a final signoff from the board before the mutual fund window can open for business. Some advisory council members, however, are in no rush to see that happen. "Unions and employee organizations, we care most about making sure we're maximizing the number of dollars our members have in retirement," said Jacqueline Simon, the public policy director of the American Federation of Government Employees, the largest federal employee union. "Buying off-the-shelf mutual funds at this mutual fund window is at odds with that goal." The average expenses that mutual funds charge can range from 0.5 to 2.5 percent, according to the website Investopedia. Those are between about 12 and 60 times higher than the fees charged by the TSP index funds. Meanwhile, progressive lawmakers would like to see the TSP go a step further. Last Congress, Sen. Jeff Merkley (D-Ore.) introduced a bill (S. 3424) — co-sponsored by 2020 presidential candidate Sen. Bernie Sanders (I-Vt.) — that would have required it to offer a fossil fuel-free index fund. But Simon, whose union represents 700,000 federal and District of Columbia government workers, doesn't think her members should be troubled by their fossil fuel holdings. "Somebody can have a very ethical life and work at EPA and enforce clean air and clean water standards or be a climate scientist or anything like that and have some of their retirement money invested in Exxon and not feel morally compromised," she said. "They're not devoting their life to being an investor, they're devoting their life to protecting the environment." Behar, on the other hand, argues that sort of compartmentalized thinking about retirement investments is part of the reason the federal government has been unable to effectively regulate the fossil fuel industry. "We all have our retirement savings funding the future that we do not want, funding the destructive paradigm," he said. If that paradigm shifts — either because of new regulatory requirements or advances in clean energy technologies — investors could be left holding greatly devalued fossil fuel assets. Many Wall Street banks have already divested from coal, which produces more planet warming emissions when burned than oil or natural gas. Last week, the pro-clean energy Institute for Energy Economics & Financial Analysis released a report showing that more than 100 major global financial institutions have restricted funding for mining and burning coal. That tally includes 40 percent of the top 40 global banks and 20 globally significant insurers. "Part of the Green New Deal has to be restructuring our retirement system," Behar said. He was referring to an ambitious resolution from Rep. Alexandria Ocasio-Cortez (D-N.Y.) and Sen. Ed Markey (D-Mass.) that aims to achieve "net-zero greenhouse gas emissions through a fair and just transition for all communities and workers." 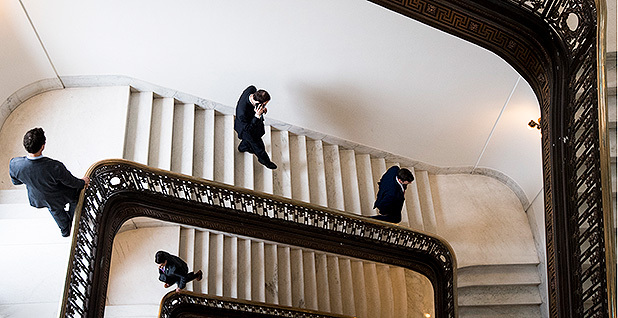 Hill staffers working on the Green New Deal and other climate measures are increasingly aware of how the current system could put them in personal financial peril. For instance, while a bill to slash the consumption of fossil fuels could protect the planet from catastrophic climate change, it might also cause Exxon's stock to plummet — harming the entire TSP and 401(k) retirement systems. "If I lose 10 percent of my retirement account, guess what? I'm working for another five years," the progressive Senate aide said. "That's not just pennies. That's a big deal." The aide added, "We are thinking about that in our climate policy — looking at how a big progressive climate package would impact low- and middle-income families through the ripple that would come from dismantling the fossil fuel industry."